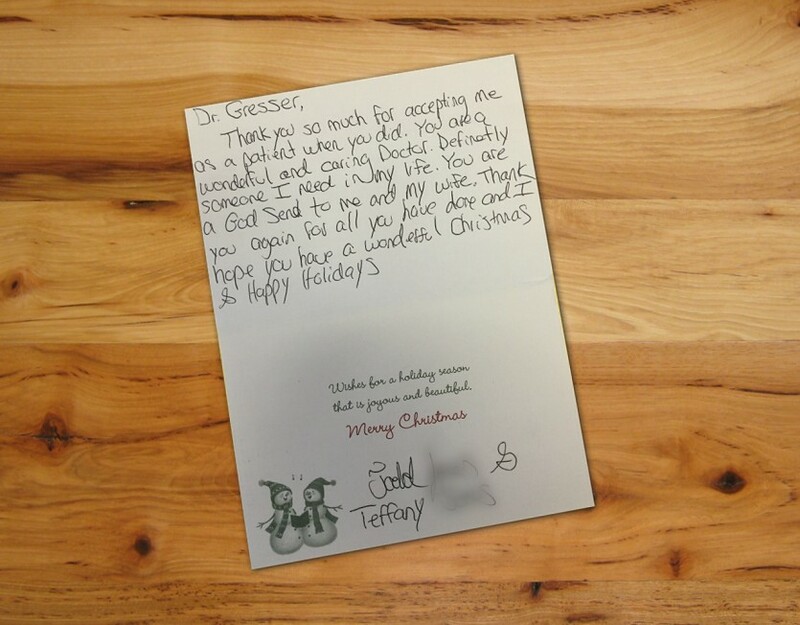 We love our patients and it’s especially gratifying when we get these heartfelt messages from them. Thank you so much for everything you do Dr. G.
I know you do this type of work from your heart. You are a great man and a great Dr!! Dr. Gresser & and his staff are so caring & respectful to me and my husband, we never feel uncomfortable going into his office. We are always treated with kindness and respect. Unlike other offices or physicians we have seen in the past, we have to say Dr. Gresser never makes us feel like we are being judged. Dr. Gresser always asks me how I am doing with my other health issues and is concerned about me and my overall health and not just treating me for one thing and send me on my way! 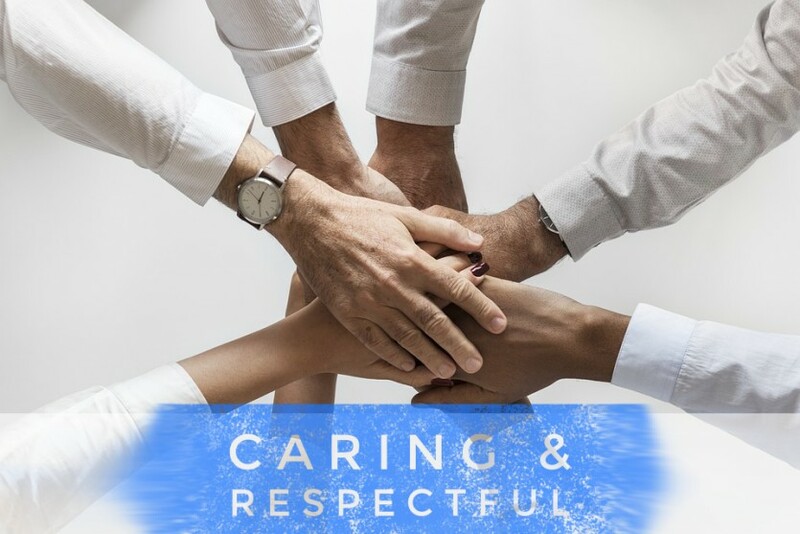 Everyone is very professional but also caring! Me and My spouse will always be grateful for Dr. Gresser and his team. 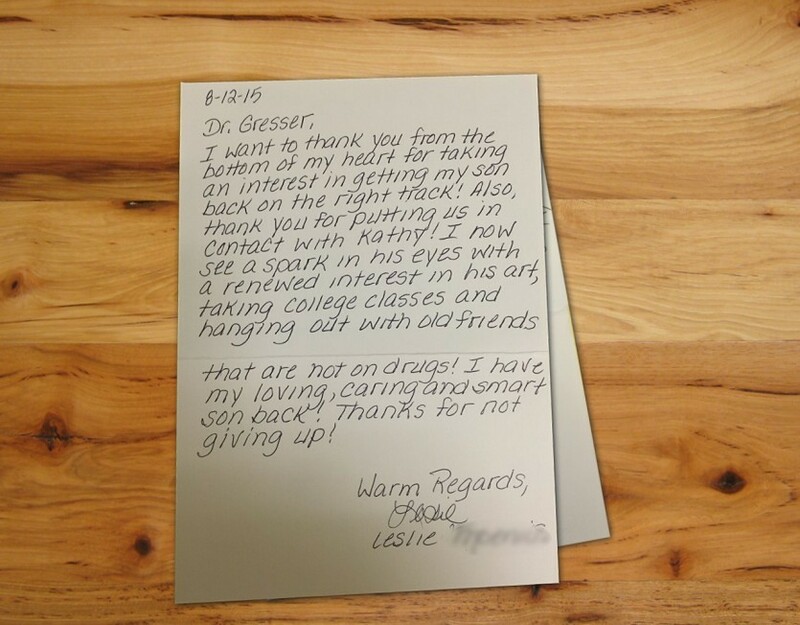 I just wanted to take a minute and say how grateful I am to be a patient of Dr Gresser. To say you have changed my life for the better would be an understatement. Each time I come for my appointment, I never have to wait, and I am treated with respect and kindness. I especially want to mention how professional and efficient everyone is. I look forward to seeing them during my appointments. I would recommend Dr Gresser if you are looking for a great Doctor to help you get your life back. Thank you so much for accepting me as a patient when you did. You are a wonder and caring doctor. Definitely someone I need in my life. You are a God send to me and my wife. Thank you again for all you have done and I hope you have a wonderful Christmas and Happy Holidays. I want to thank you from the bottom of my heart for taking an interest in getting my son back on the right track! Also, thank you for putting us in contact with Kathy! I now see a spark in his eyes with a renewed interest in his art, taking college classes and hanging out with old friends that are not on drugs! I have my loving, caring and smart son back! Thanks for not giving up!